The simplest and most economical way to reduce your energy costs is to find out how much energy your home uses, and how you can consume less. A home energy audit will give you the answers. Audits tell you how efficient your appliances are and where your home loses energy. You can then take steps to correct any problems. Below are some online resources for conducting your own home energy audit. If you wish, you can have a professional audit your home more thoroughly. Information on home services and rebates. These include home visits by energy experts at low or no cost to you, and other incentives and rebates for installing energy-efficient measures in your home. General information on home energy audits. How to carry out a home energy audit. What you should know before calling a professional. A calculator that shows you how much money you could save by improving your home’s energy efficiency. This website lets you enter detailed home data for an accurate estimate of savings. Plus, it gives a breakdown of energy usage and carbon dioxide emissions of average and energy-efficient homes in your zip code. General information on self-audits, professional audits and efficiency improvements with ENERGY STAR products. A home energy yardstick that compares your home’s energy use and compares it to others throughout the country. All you need are the last 12 months of utility bills, your source or energy and the square footage of your home. 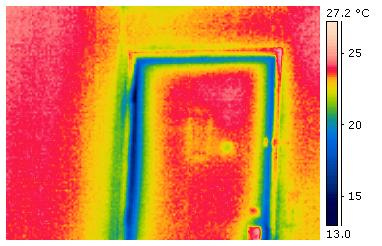 Photo: Thermal image of cold air (blue) entering a warm room (red) through cracks around the door. Credit: CBC || Thermal, licensed from Flickr under Creative Commons.